Accepting the award for the foundation were Mr. Rick Horne and Ms. Lucy Hawes. 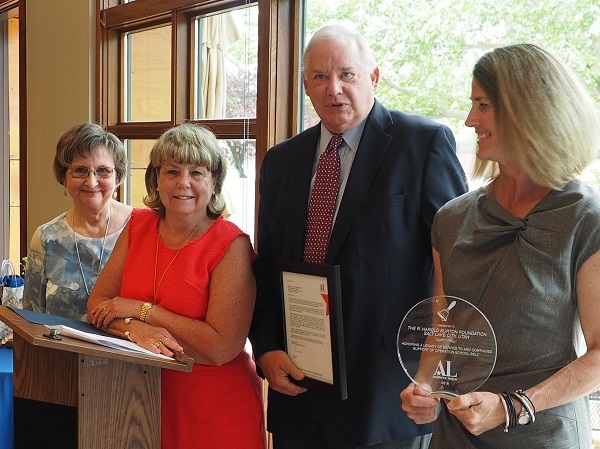 Assistance League of Salt Lake City proudly presented the 2018 Operation School Bell® Award to the R. Harold Burton Foundation at the chapter’s Annual Meeting and Luncheon held on May 21 at the Cottonwood Country Club. The R. Harold Burton Foundation has continuously provided financial support for our flagship Operation School Bell program since 2000. Each year, prior to awarding us a grant, they request a meeting with the chairmen of Operation School Bell and Fund Development to learn of new developments in the program. They take an active and sincere interest in program changes, challenges and opportunities. Their enthusiasm provides significant moral support to our members. The Executive Director of the R. Harold Burton Foundation has requested sample clothing bundles of boys’ and girls’ school clothes to share at their Board meeting to better communicate what students actually receive through the program. Each year, we count on the Burton Foundation’s loyalty and consistent support to ensure the success of Operation School Bell. Our chapter was pleased to have had an opportunity to acknowledge their generosity with this special award.